Ferocious and resolute, the wolf is an ideal animal for a warrior to emulate. Pack mentality and feral instinct combine in this predator to make it truly difficult foe to beat, and in this WarWolf Armor with Pauldrons, you will be a true wolf to your foes. And not only will you harness the visage of the deadly wolf, but you will also start to feel like one, acting with the lethal poise and grace of this feared pack hunter. This armor consists of a stunning cuirass that features an underplate that has a rich cordovan coloration, almost similar to a rich shade of fading mahogany. 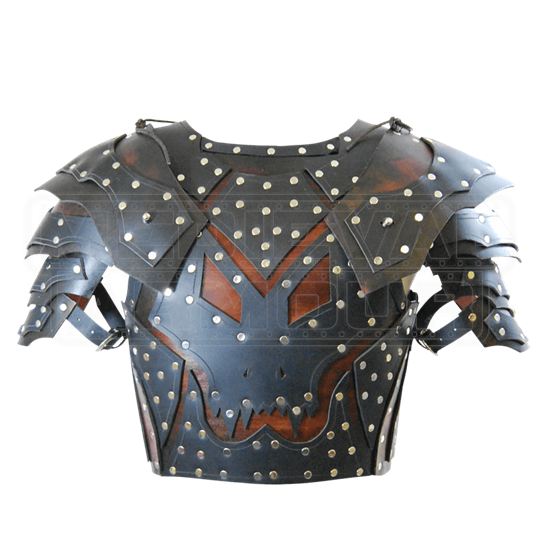 Riveted to this base are several black leather plates, which not only give the armor an increased level of strength and durability, but also create a truly impressive design, as the plates are shaped and arranged so that the visage of a wolf is openly displayed on the armors chest. And as its name suggests, the WarWolf Armor with Pauldrons includes a pair of shoulder protectors, which consist of a series of leather strips, fastened together to create a tiered defense. The pauldrons are tied to the shoulders of the cuirass, while also featuring belted fasteners with buckles and grommets to secure the bottom of the pauldron to the wearers arm, ensuring that free movement is retained. Being made from 9-10 oz. leather, this armor has good weight and good strength, possessing all the durability necessary to be used as costume armor or LARP gear. The relatively open arms also help to cut down on any form of movement restriction, ensuring that your sword arm and your shield arm work just like they are supposed to! The armor comes in one color, which possesses both black and cordovan hues. It also comes in four sizes, all of which are highly adjustable thanks to the belted straps that secure the armor in place. This WarWolf Armor with Pauldrons will transform you into a real wolf on the battlefield, so much so that the only howling you will hear will be the groans of displeasure and defeat from all those who you chose to make into your favored prey.